20 years ago my mrs bought 65 tamarind plants, her and mum planted them, in about 5 years they were fruiting, I asked mrs, did you weed around them, water them, fertilize them? no on all 3 counts, have they ever been fertilised? once, about 7 years ago, have you used weedkiller under the trees? no need, nothing grows under the tree, only the most vigorus creeper, if it climbs the tree, just cut base and it will die. So Tamarind gets my vote as the best organic tree, does anybody know of another tree with the same qualities? Apply 5 tons of fermented compost per acre (or 1kg per square meter) before planting or when forming beds. The same dose should be repeated every year for the adult plants. Adequate and efficient manuring of young and mature papaya tree is essential to maintain the health of the papaya and to obtain high yields. It is a heavy feeder crop. 200–250g each of N, P2O5 and K2O are recommended for getting high yield. Significant uptake of the nutrients is observed after flowering. micro organisms in a viable state intended for seed or soil application and designed to improve soil fertility and help plant growth by increasing the number and biological activity of desired microorganisms in the root environment. Apply biofertilizers viz.,Vesicular Arbuscular Mycorrhizae (VAM), Azospirillum and Phosphobacteria each @ 20 g per plant and again six months after planting. • Adequate manuring of young seedlings is of the greatest importance towards the production of vigorous healthy seedlings. • Do not apply chemical manures to papaya seed nursery at the time of planting as high concentration of nutrient solutions in the soil coming in contact with the tender roots of the seedlings may cause permanent damage. 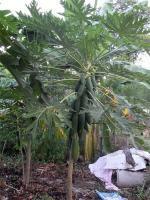 • Both organic and inorganic manures are beneficial to the papaya plant. Apply only dry and well rotten cattle manure @ 4-5 kg per pit. Apply 0.25-0.5kg borax per 100 plants right before dry season in soil which is boron- deficient. For the young trees, apply compound fertilizers in the trench (10 cm deep and 15 cm wide) around the outer of tree crown, then fill back the soil. As for the adult trees, apply in the trench (10 cm x 15 cm) at both sides of the tree and fill back the soil, or top dress at furrows after irrigation. soil. Take care such that no fertilizer comes in direct contact with any above ground parts of the plant. "Nitrogen deficiency symptoms of 'Cariflora' papaya leaves included a progressive change in leaf color from green to light green to yellowish green to completely yellow in color of only the older leaves (Figure 4.9). Omission of N also reduced the size and shape of the leaves. However, there was no significant difference among N petiole nutrient levels of either the complete or omission treatment (Table 4.3). In general, nutrient levels of the leaf lamina were higher and more variable than the petiole levels for all the elements (Table 4.3). This was consistent with what researchers in Hawaii have found (Awada and Long, 1971a). From their work it was found that analysis of papaya petioles were a more reliable indicator of plant nutrient status than papaya leaf tissue. Potassium deficiency symptoms were quick to appear on the mature leaves and included pronounced raised veins on the undersides of leaves, dark green color, and strap-like distortion to the lobes of the leaf (Figure 4.10). There was no significant difference among N petiole nutrient levels of complete and minus N treated plants (Table 4.3). The potassium nutrient concentration was significantly lower in leaf and petiole tissue of the minus K treatment (Table 4.3). Potassium nutrient levels were significantly lower in the minus K treatment. In general, nutrient levels were lower in petioles of the nutrient omission treatments than in petioles of the complete treatments. Magnesium deficiency symptoms of 'Cariflora' papaya appeared first in the older leaves and included mottling (light yellow and dark green areas) which sometimes coalesced forming larger chlorotic areas and general chlorosis with intervenal areas remaining green (Figure 4.11). Magnesium was found to be significantly lower for both the leaf and petiole analysis of the omission treatments (Table 4.3). 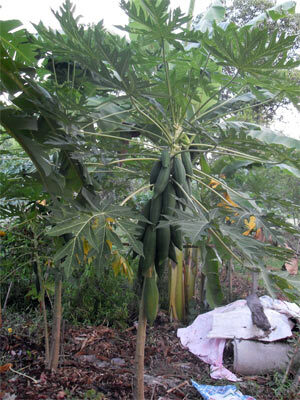 Iron deficiency symptoms of 'Cariflora' papaya first appeared on younger leaves and included gradual intervenal chlorosis and stunting of leaves (Figure 4.12). Papaya petiole and leaf Fe levels of the omission treatment were lower in concentration than the complete treatment but not significantly reduced (Table 4.3). Zinc deficiency symptoms of 'Cariflora' papaya included pronounced raised, light green veins on the upper and lower leaf surface, distorted strap-like leaf lobes, and a slight yellowing of the youngest leaves (Figure 4.13). Leaf and petiole levels of the omission treatments were lower than the complete treatment but not significantly reduced (Table 4.3). Symptoms of Mn deficiency included yellow mottling to severe chlorosis of older leaves (Figure 4.14). Leaf and petiole nutrient levels of the omission treatment were not significantly reduced, although the mean of the minus Mn treatment were lower than the complete treatment (Table 4.3). Symptoms of B deficiency are suspected to have appeared in two replications of the control treatments even though adequate amounts were applied in the complete nutrient solution. A peculiar malformed, thickened appearance of the leaves with a stunted bunchy growth symptom of the apical meristem were exhibited similar to visual symptoms reported by Cibes and Gaxtambide (1978). Boron deficiency symptoms have not been characterized for papaya leaves in Florida and has not been recognized as a deficiency problem for papaya production in Florida. Table 4.4 Effect of nutrient omission on diameter and height growth of 'Cariflora' papaya trees grown in sand culture. z Comparisons significant at the 0.05 level (Dunnett's T test). y Standard deviation in parentheses. in stem diameter growth was observed with the minus N treatment (Table 4.4). The second largest significant reduction in diameter was caused by the absence of K. The decrease in total diameter growth due to the lack of Zn was ranked third, but was not significant. Papaya stem diameter and tree height was significantly reduced for the minus N and K treatments compared to their respective complete treatments (Table 4.4). The minus Mg, Fe, Mn, and the complete treatment did not result in any significant decrease in either diameter growth or height." They are very similar to the species guides in the UN organic fruit and veg from the tropics guide if not identical.New species covered are rice,sesame,macadamia, coffee,cashew,sugarcane,peanuts,tea and (one for Smithson) papaya.I've also included the duplications of species already covered in the UN guide in this folder and if I can learn meself a new bit of software will try and strip the rest of the species guides from the UN PDF and upload them as individual files for quicker reference.This new thread is certainly helping me get all my files in order !! Smithson did you manage to resolve your problem with downloading the vermiculture material ?? let us know if you could be so kind so that I can post whats required to download from the site for others or look into the problem further. I live in Phetchabun where tamarind is the OTOP product since they do best in this province and they are grown just everywhere. In my observation the farming practices are anything but green. They occasionally go walking around spraying the ground with something that I think of as agent orange though surely not. One day there are green weeds and yes, weeds do regularly pop up. The next day they are brown and dead. I also see them spraying up in the leaves of the trees with chemicals. The amount of bags of fertilizer I see stacked around is enormous, though not sure how much is for the trees vs the fields. The runoff is already a real water quality problem and there is no drinkable water here. Whoever said all they did was add fertilizer once many years ago and let the trees go natural from then on I take with a grain of salt. I have no doubt tamarind can be grown organically, it certainly was until a generation or so ago. But in my observation there is absolutely no desire to do so. Chemicals are cheap and easy and used generously to remedy every problem so when you buy tamarind at the store, that is what you are going to get. Hi Canopy, welcome to the organic forum, where to start on tamarind trees? If they are spraying uner the trees on odd weeds, yes, this is bad news, the spray will go into the soil and into the roots of the tree, there is nothing much grows uner the tree, so best cut it off and leave as a N replacement. If you want to fert a tree, 1.5 kilo a month, so thats about 30 trees 1 bag a month, you say youve seen lots of bags stacked up, i have the same too, fert bags, but they are full of cow/chicken/pig/bat guano, perhaps these bags are the same?? Im pretty certain the last time the trees had fert was 7 years ago, they have never had weedkiller under them, no need, PM me your adress, and i will send you 1/2 kilo, you can have them lab tested for chems whatever, no obligation. Thank you for providing these optimistic possibilities. I hope you are right on all counts. I find the information on this forum extremely valuable and have been doing a lot of reading with a lot more to go. I plan to have a wide array of organic plantings after getting some land so appreciate the offer. Just about all land for sale around here has tamarinds on it and the first thing I will do is assure they have an organic future. I am one of the guys who have tested supergreen and was amazed. Sceptical at first but in just 18 days some sick and small cassava was totally rejuvenated. taller cassava as can hardly walk through it waving a sprayer around. Do you look for organic fertilizers? No I make my own. With a few ideas from a friend and heaps of web searches it all fell into place. Bio-Active Organic fertiliser. The really nice part, no fillers other than organic material. Slow release complete fertiliser. So far so good. Edit: forgot to mention I am planning three blends for vegetables dependant on feeding requirements. Low, medium and heavy. Any OP seed savers in Isaaan?